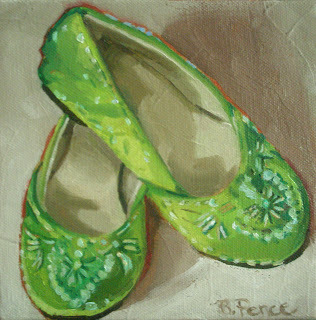 I had a tough time yesterday with this painting. I covered the surface with Liquin, and then wiped it down before painting, a practice I've not had trouble with before, but this time made the second pass at the painting very difficult. 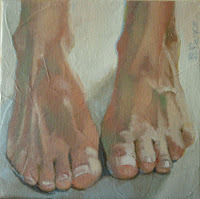 The paintbrushes just seemed to drag across the surface and I couldn't put down a nice flow of paint. i felt like I had very little control over the brushes' application of the paint. I'll post it anyway, but I don't think there is much noticeable difference between the first day and this one. I'll go into it again without the Liquin and see how it works for me. First pass at a second panel for the new multi-panel painting. 13 1/2" X 10". First day's effort. 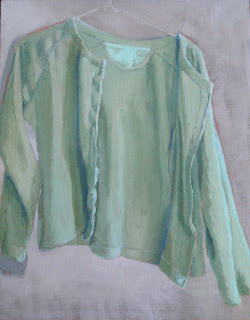 This is the first panel of a multi-panel painting. 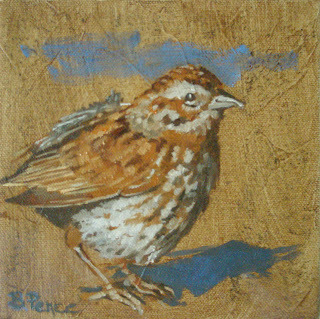 For now, this is the last of my series of Little Brown Birds. 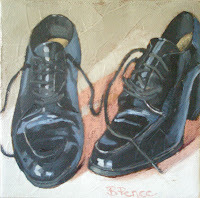 If you are interested in bidding on this painting, click here. 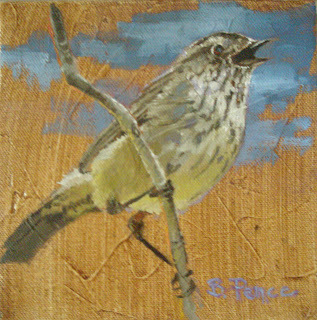 I never thought I would be painting birds, but yesterday's experience was so satisfying, I've done another one. These little brown birds (LBBs) do of course have formal names, but I'm ignorant of them, and I like it that they are rather anonymous to most of us and therefore still have a freshness that other, better known, birds don't have. My bird-watching friends call these little no-name birds, "LBBs". I think they deserve a proper name. 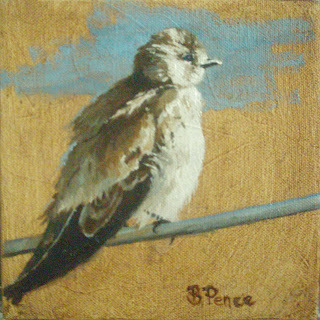 I've never painted a bird before, but am planning to include one in a future painting, so this was practice. I liked doing it. Maybe I'll do more. 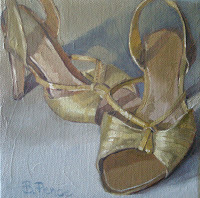 This is my composite shoe painting - so far. No doubt, I'll modify it slightly as it sits on my wall a few days, including perhaps going back into individual paintings as well as organizing them somewhat differently. These are revisions of prior daily paintings. 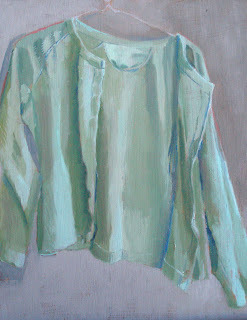 Sometimes I can't resist, when a painting sticks around for a while, going back into it. Today I went back into all three of these paintings, muting the background, changing the colors of shadows. 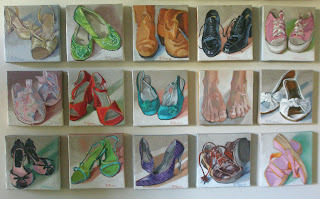 It is all part of a plan to modify several of my shoe paintings to become part of a larger, multi-image painting. I like them better with the revisions. But you can be the judge, if you like, by comparing them to the original images on these dates, from top to bottom: "Arm Candy" on May 1st, 2008; "No Shoes" on May 20th, 2008; and "Serious Shoes" on May 9th, 2008. In a couple of days, I'll display the completed work. If you saw this painting yesterday (Aug. 11th), it probably didn't seem as pink or bright as it looks now. When I looked at the photo compared to the actual piece, I realized the photo hadn't properly captured the brightness of it. So I re-photographed it. Amazing how the light or surroundings of a painting impact the colors recorded by the camera. I'm finally back, following a long trip to Bolivia and Colombia and another one to do the RAGBRAI (Annual Great Bicycle Ride Across Iowa). 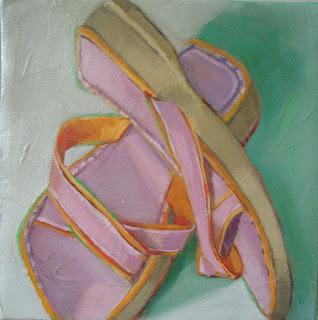 It's been too long and it was great to be back in the studio again, though it took a while to get back in a groove with the paint, the brushes, etc.